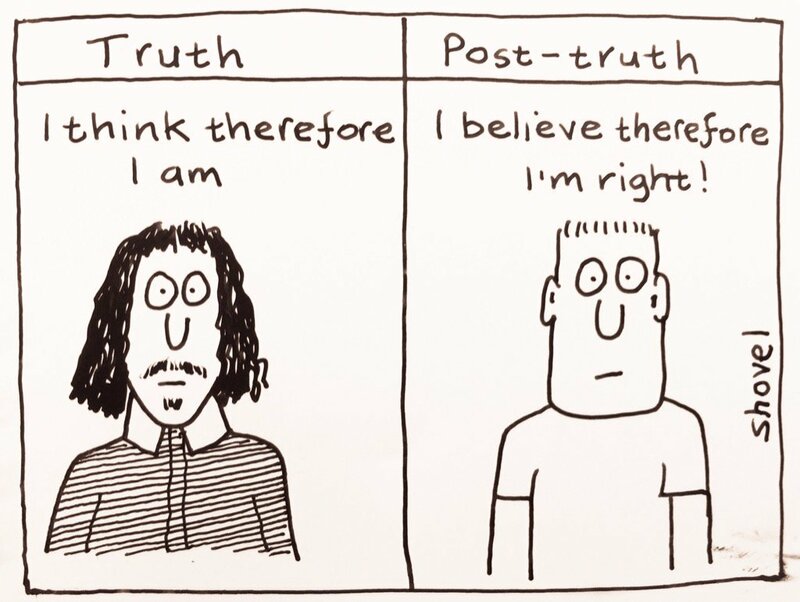 For quite sometime now, this notion of post-truth has been in circulation. Ever since Donald Trump took up the presidency of the US, it has gained all the more prominence. Perhaps that's the only rational explanation one can offer to the otherwise seemingly bizarre and totally 'wrong' things one encounters or sees others hold as right. The age old debate between science and religion, as to which of them is right is now no more the central argument. Why so? Has it been resolved? Or is it that the issue is no more relevant? Or is there is a sort of tiredness to keep getting at one another's throat that there is now a declared 'peace'? Perhaps the way science has reviewed itself over the past few decades has something to do with it. Something religion is still shy of doing or at least some feeble attempts are being made in some parts. 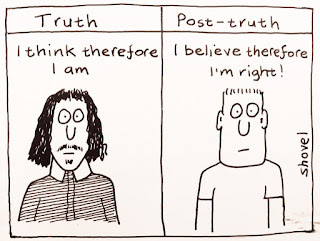 In 1970 W. V. Quine and J. S. Ullian in their book The Web of Belief made a strange argument: that scientific statements are truths not because of their fidelity to external facts but due to their internal coherence and persuasiveness they share with other narratives and statements. Our beliefs face the test of experience not as each individual compartmentalized fact but as a web or layered body. Moreover our interaction of individual experience is only with the margins of our belief, not the core of what we hold as true. So whenever there is something that contradicts or challenges our belief, we are prompted to restore consistency. But in choosing what to revise or change, we are not guided by facts alone. The central challenge is not fidelity to external facts but semblance of the entire web. And in this process, we might end either changing one of the marginal beliefs or even the core of the web. What plays a crucial role in this whole process is the authority we choose to trust. If this principle is right, then it does explain how one can have two seemingly and 'apparent' contradictory beliefs which for one person are totally opposite and for another perfectly compatible. It is just that they both choose a different authority source. What then of the external fact? Does that no more have a say in what holds as true or false? It does but again, what guarantee that what you see is right? After all, for centuries science believed in geo-centrism. Technology experts could think of mega data storage only in terms of cabinet files and godowns. Well, if that is the case of observable external facts, what about non-material unperceivable realities of life? Of values and principles? Though the complications are multiplied, the basic argument of Quine and Ullian about a 'web of belief' still holds true.